Appointments Are Limited! Call 803-567-5847 Today! Call 803-567-5847 to schedule your first appointment. Many people experience hearing loss, especially as they age. When you notice that you are missing more than you used to, visit Miracle-Ear® for the solution you need. Our center is the place to go for hearing aids in Santee, SC, with a diverse array of options available. Stop by today for free hearing testing and learn how these innovative solutions can change your daily life. Make sure you don’t miss out on life’s most important conversation. Come see our highly experienced Hearing Care Specialists when you suspect you are losing your hearing. We will assess you and equip you with the appropriate solution. With over 1,300 locations in the United States, Miracle-Ear is the nation’s #1 most recognized hearing aid brand. Our center carries a variety of different styles, allowing you to find the aid that best suits your needs and lifestyle. We are continually improving our products with meaningful innovations like GENIUS™ Technology and ClearVation Technology. Furthermore, our hearing aids are backed by a risk-free 30-day trial. Our Hearing Care Specialists are committed to your complete satisfaction and pay close attention to detail to ensure you have the best possible experience with our products. Schedule an appointment or walk into our hearing center today to learn more. Contact us if you have any questions about our hearing aids and related services. Our center is proud to serve customers from throughout Santee and Eutawville, South Carolina, and the surrounding areas. As a trained Hearing Instrument Specialist and certified Miracle-Ear product expert, I am dedicated to helping my patients find the right solution for their lifestyle. I am passionate about getting to know my patients and enjoy using my knowledge to not only improve their hearing, but also improve their quality of life. My favorite part about working for Miracle-Ear is getting to know new people, building those relationships, and changing lives by giving patients the opportunity to hear things they haven't heard in years. I am proud to support the Santee community for all hearing health needs. Janna joined the Miracle-Ear team earlier this year. Janna is officially certified as a Front Office Associate for Miracle-Ear. 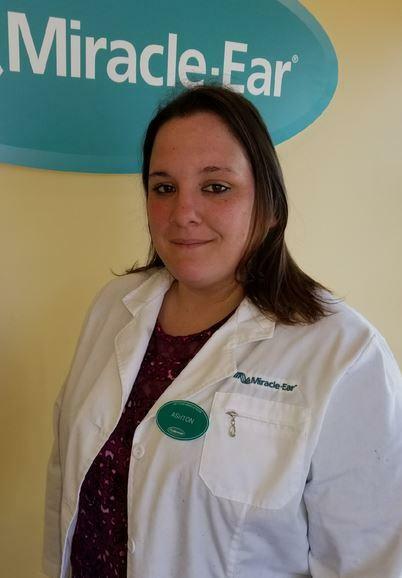 Janna's favorite part of working with Miracle-Ear is speaking with and getting to know all of their patients while doing everything in her power to satisfy the clients' hearing aid needs.